Mazda Motor Corporation today announced the launch of its new global brand visual identity which will be rolled out progressively around the world. Following a successful pilot in Australia, the first major region to introduce this new visual identity direction will be Japan, commencing on June 20, 2008, when Mazda updates its Japan websites with distinctive new features. This will be followed by its full adoption in advertising, commencing on July 8 with the launch of the new mid-size Mazda Biante high-roof minivan in Japan. The new global visual identity was created to evoke strong emotional connections between Mazda and its customers across all touchpoints, and convey the brand’s unique personality and distinctive profile. Mazda’s brand symbol and the brand essence will not change. The new visual identity is intended to express the new direction the Mazda brand is taking, its evolution and the innovation that lies at its core. This fresh new way of articulating the Mazda brand will be integrated into every facet of Mazda’s future brand communications. The new global brand visual identity uses distinctive visual cues to express Mazda’s brand personality. These include the use of dynamic angles to convey a sense of movement; a new Mazda typeface to complement the other elements of the new visual identity; and a new ‘dynamic wing’ graphic which contains the Mazda brand symbol and captures Mazda’s confident, bold spirit. In addition, launching the new visual identity will ensure clarity and consistency in all Mazda communications across the globe. Mazda introduced its existing corporate identity (CI) in 1975 and developed its corporate mark as an easy-to-read standard for use in its global communications. 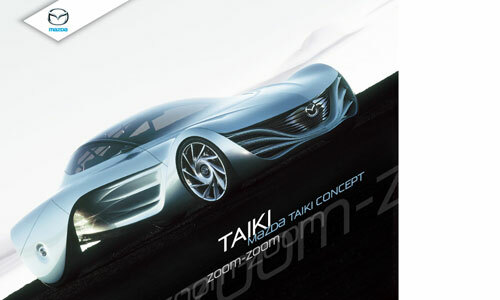 The brand symbol was created in 1997 as one element of Mazda’s efforts to strengthen its brand image. Since the launch of the original Mazda6 in 2002, Mazda’s Zoom-Zoom brand message has gained currency all over the world. Looking to the future, Mazda will continue to pursue harmony between driving pleasure and environmental and safety features, and delight its customers with exciting vehicles that ‘look inviting to drive, are fun to drive, and make you want to drive them again.’ With the introduction of its new global visual identity, the Hiroshima-based company will aim for continued improvements in its brand value.